The main draw at UFC 191 has finally been revealed and it is going to take place in the flyweight division. 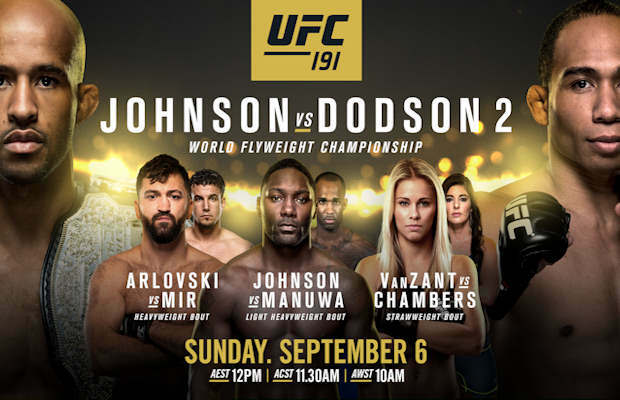 Announced during the broadcast of Duffee vs. Mir at the UFC Fight Night, Demetrious Johnson, the reigning flyweight champion, is going to fight John Dodson at the UFC 191 to be held in Las Vegas at the MGM Grand on the 5th of September. The last time they met was way back in January 2013 at the UFC on FOX 6 event in Chicago where the Demetrious Johnson was awarded a win by unanimous decision in spite of two early knockdowns. The rematch at UFC 191 is bound to be as thrilling as the first one. During the match, Dodson proved to be the equal of Johnson in terms of speed. In fact, Dodson managed to even drop Mighty Mouse twice with his left hand. However, as the match progressed, it became clear who the champion was as Johnson regained control. He almost finished the challenger during the dying seconds of the 5th round. Johnson went on to win the fight with a unanimous decision. The match was undoubtedly thrilling as proved by the Fight of the Night honors given to both the participants. The UFC on FOX 6 event was a narrow win for Mighty Mouse with the referees scoring as 49–46, 48–47 and 48–47. Since then, Demetrious Johnson with his record of 22-2-1 has been an absolute sensation to watch. Among the last five of his title defenses, four of them ended with a finish. The most entertaining title defense was undoubtedly the match against Kyoji Horiguchi. In that match, Johnson forced Horiguchi to submit with an armbar with just one second left on the clock in the 5th round. Even without the move, Johnson would have won the match 50-45. The stoppage at 4:59 of the 5th round is undoubtedly the latest stoppage to take place in a main event or a title fight unless 7 round fights are implemented by UFC. Mighty Mouse has been a force to be reckoned with thanks to his long dominance as the sole UFC flyweight champion. On the other side, John ‘The Magician’ Dodson with his record of 17-6 has notched up 3 straight wins since then. Inside the Octagon, Dodson has only been beaten by Johnson. Since January 2013, Dodson has outfought Darrell Montague and John Moraga. Unfortunately, he suffered an anterior cruciate ligament injury which forced him into the sidelines for almost a year. After recovering, he went on to win the UFC 187 against Zach Makovsky through a lucky unanimous decision as his performance was not up to the mark. Among the other cards scheduled for the UFC 191 is Anthony Johnson vs. Jimi Manuwa in the light heavyweight category. Anthony Johnson was originally scheduled to fight Jan Blachowicz but the plans were scrapped. John Lineker will make his return to the bantamweight category by going up against Franciso Rivera who is certain to put up a fight after knocking Alex Carceras out in only 21 seconds. Paige VanZant is scheduled to fight against Alex Chambers in the women’s strawweight category.